Captain James Hook is a fictional character, the main antagonist of J. M. Barrie's play Peter Pan; or, the Boy Who Wouldn't Grow Up and its various adaptations, in which he is Peter Pan's archenemy. The character is a pirate captain of the brig Jolly Roger. His two principal fears are the sight of his own blood (supposedly an unnatural colour) and the crocodile who pursues him after eating the hand cut off by Pan. An iron hook replaced his severed hand, which gave the pirate his name. The works of J. M. Barrie about Peter Pan feature many characters. The numerous adaptations and sequels to those stories feature many of the same characters, and introduce new ones. Most of these strive for continuity with Barrie's work, developing a fairly consistent cast of characters living in Neverland and the real-world settings of Barrie's stories. Sir James Matthew Barrie, 1st Baronet, (; 9 May 1860 – 19 June 1937) was a Scottish novelist and playwright, best remembered today as the creator of Peter Pan. He was born and educated in Scotland and then moved to London, where he wrote a number of successful novels and plays. There he met the Llewelyn Davies boys, who inspired him to write about a baby boy who has magical adventures in Kensington Gardens (included in The Little White Bird), then to write Peter Pan, or The Boy Who Wouldn't Grow Up, a "fairy play" about an ageless boy and an ordinary girl named Wendy who have adventures in the fantasy setting of Neverland. Neverland is a fictional island featured in the works of J. M. Barrie and those based on them. It is an imaginary faraway place, where Peter Pan, Tinker Bell, the Lost Boys and other mythical creatures and beings live. Although not all people who come to Neverland cease to age, its best known resident famously refused to grow up. The term is often used as a metaphor for eternal childhood (and childishness), immortality, and escapism. The concept was first introduced as "the Never Never Land" in the theatre play Peter Pan, or The Boy Who Wouldn't Grow Up by Scottish writer J. M. Barrie, first staged in 1904. In his 1911 novelisation Peter and Wendy, Barrie referred to "the Neverland", and its many variations "the Neverlands", although the caption to one of F. D. Bedford's illustrations calls it "The Never Never Land". In the earliest drafts of Barrie's play, the island was called "Peter's Never Never Never Land", a name possibly influenced by "the Never Never", a contemporary term for outback Australia. In the 1928 published version of the script, the name was shortened to "the Never Land". Neverland has been featured prominently in subsequent works that either adapted Barrie's works or expanded upon them. These Neverlands sometimes vary in nature from the original. Peter Pan is a musical based on J. M. Barrie's 1904 play Peter Pan and Barrie's own novelization of it, Peter and Wendy. The music is mostly by Mark "Moose" Charlap, with additional music by Jule Styne, and most of the lyrics were written by Carolyn Leigh, with additional lyrics by Betty Comden and Adolph Green. The original 1954 Broadway production, starring Mary Martin as Peter and Cyril Ritchard as Captain Hook, earned Tony Awards for both stars. It was followed by NBC telecasts of it in 1955, 1956, and 1960 with the same stars, plus several rebroadcasts of the 1960 telecast. In 2014, the musical was broadcast on NBC featuring several new numbers, and starring Allison Williams and Christopher Walken. The show has enjoyed several revivals onstage. Contrary to the traditional stage casting, the film featured a young boy in the title role. Since the first stage production of the story, the title role has usually been played by a woman, a tradition followed in the first film adaptation. Two subsequent animated adaptations have featured a male voice actor as Peter Pan, and a Soviet live-action film adaptation for television cast a boy to play the role. This film was the first live-action theatrical release with a boy playing the part. The casting of a single actor to play both George Darling and Captain Hook follows a tradition also begun in the first staging of the play. Peter Pan received positive reviews from critics, but was a box office bomb, grossing $48.5 million in the United States and Canada, and $122 million worldwide, from a $130.6 million budget. resulting in a $70-95 million dollar loss. Peter Pan Bus Lines is a long-distance/commuter bus carrier headquartered in Springfield, Massachusetts. It operates in the northeastern United States. As of Fall 2014, Peter Pan operated bus lines in Connecticut, District of Columbia, Delaware, Massachusetts, Maryland, New Hampshire, New Jersey, New York, Pennsylvania and Rhode Island. Over four million passengers per year travel on Peter Pan's bus routes. The company was founded as Yellow Cab Air Line in Springfield, where the company remains based, and was purchased by Peter Carmen Picknelly in 1933. The Picknelly family still owns the company. The company logo is based on an illustration by Roy Best. Each bus, in addition to a number, is also given a name based on the Peter Pan stories. Peter Pan was affiliated with Trailways beginning in the 1990s, but ended that affiliation in 2005. In 1999, an alliance was formed with Greyhound Lines, coordinating schedules, marketing, and ticket sales. In August 2017, it was announced that this partnership would cease effective September 27, 2017. 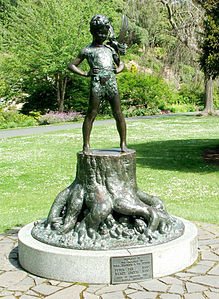 The Peter Pan statue is a bronze sculpture of J. M. Barrie's character Peter Pan. It was commissioned by Barrie and made by Sir George Frampton. The original statue is displayed in Kensington Gardens in London, to the west of The Long Water, close to Barrie's former home on Bayswater Road. 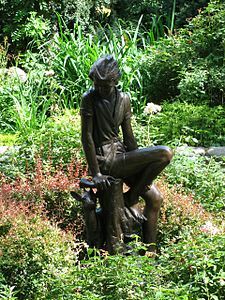 Barrie's stories were inspired in part by the gardens: the statue is located at the place where Peter Pan lands in Barrie's book The Little White Bird after flying out of his nursery. 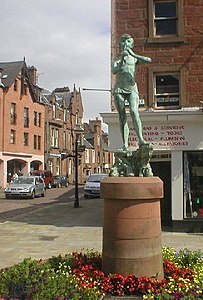 Six other casts made by the original artist have been erected in other locations around the world. Peter Pan syndrome is an inability to grow up or engage in behaviour usually associated with adulthood. The term comes from the fictional children's character Peter Pan, who never ages. While transageism, or adults regarding themselves as juveniles or adolescents (also referred to as "juvenilism" and "adolescentilism", respectively) is not listed in the Diagnostic and Statistical Manual of Mental Disorders, and is not recognized by the American Psychiatric Association as a specific mental disorder, the concept is falsely modelled on transgenderism. This transeageist concept has garnered a great deal of controversy. People who exhibit characteristics associated with the Peter Pan syndrome are sometimes referred to as Peter Panners.The concept gained popularity through Dr. Dan Kiley (psychoanalyst) in his book The Peter Pan Syndrome: Men Who Have Never Grown Up first published in 1983. His book became an international best seller and led to a wave of copycat pop-psychology books. Dr. Kiley got the idea for "The Peter Pan Syndrome" after noticing that, like the famous character in the J. M. Barrie play, many of the troubled teenage boys he treated had problems growing up and accepting adult responsibilities. This trouble continued on into adulthood. Return to Never Land (also known as Peter Pan in Disney's Return to Never Land and later retitled Peter Pan: Return to Never Land on current home video release) is a 2002 American animated fantasy-adventure film produced by Walt Disney Television Animation, and released by Walt Disney Pictures and distributed by Buena Vista Pictures. The film is a sequel to Walt Disney Feature Animation 1953 film Peter Pan, It is based on J. M. Barrie's novel Peter and Wendy, and had a worldwide gross of $109 million.The film follows Wendy's daughter who refuses to believe in her mother's story during the Blitz in London, only to be mistakenly brought to Neverland by the pirates. In order for her to get home, she meets Peter Pan, Tinker Bell and the Lost Boys who encourage her to fly and make her believe. The Adventures of Peter Pan (ピーターパンの冒険, Pītā Pan no Bōken) is an anime series by Nippon Animation, directed by Yoshio Kuroda, which first aired in Japan on Fuji Television between January 15, 1989 and December 24, 1989. An adaptation of the classic Peter Pan novel by James Matthew Barrie, the series spanned a total of 41 episodes. It was scheduled to start on January 8, 1989, but due to the death of Emperor Shōwa, the premiere got postponed for a week. It was part of the World Masterpiece Theater, a famed animation staple by Nippon Animation, which produced an animated version of a different classical book or story each year. The anime, while adapting material from the original novel, also adds numerous original story arcs. The series was also later translated and released in several international audiences worldwide in 1990, sometimes under the name Peter Pan: The Animated Series. In Europe, it was broadcast on the television networks: Telecinco (Spain), SIC (Portugal), RTL Television (Germany), KiKA (Germany), Italia 1 (Italy), TV3 (Sweden) and Fox Kids (Sweden), Yleisradio (Finland) and TVP 2 (Poland). It also aired in numerous other countries, such as Israel (on IETV and Fox Kids), Brazil and later United States on Nick Jr. From 1990 to 1995: Brazil (Rede Globo), Mexico (XHGC), Philippines (ABS-CBN) and the From 2009 to 2012 Indonesia (Spacetoon). At first only a supporting character described by her creator as "a common fairy", her animated incarnation was a hit and has since become a widely recognized unofficial mascot of The Walt Disney Company, and the centrepiece of its Disney Fairies media franchise including the direct-to-DVD film series Tinker Bell and Walt Disney's Wonderful World of Color.